2. Traveling With T has 3 giveaways: A Letter To My Mom, Dear Carolina by Kristy Woodson Harvey, and The Promise by Ann Weisgarber. 3. Twitter chats happening next week- The Daughter by Jane Shemilt on 5/13/15 @ 4pmEST and The Bookseller by Cynthia Swanson on 5/11/15 @ 8pmEST. Use #srbkchat to join in both. Giveaways (US only) will be happening! 4. Got some good-looking #bookmail this week! 5. I’m in the middle of planning my BEA trip- here are some of the books I am hoping to get! 7. What are your #fridayreads? I’m reading French Coast by Anita Hughes. I have been trying to finish a book by Debbie Macomber. It’s a short, quick read-I just need to take the time to do it! Looking forward to this weekend with my kids! Yay!!!!! Time with kids = so important! The Husband’s Secret is good- and her next one Big Little Lies is even better (IMO). Let me know what you thought of THS when you finish it! 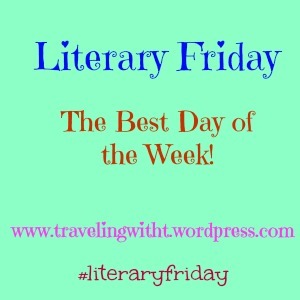 I enjoy your Literary Fridays T! I hope you have good news this weekend. Thanks so much! I had a good weekend, but did not get the news I was hoping for- I *thought* it was a possibility that my SIL was pregnant again- but that was not the surprise they had to tell about! Oh well!